What are earthquakes? Get a new perspective on these powerful phenomena with our collection of videos and infographics co-produced with KQED, originally designed with middle and high school educators in mind. You and your students will learn why earthquakes happen, how they've shaped the Bay Area, and what you can do to prepare for the next one. We've included ideas for how to structure a sequence of learning tasks, but feel free to pick and choose! Whether you approach the Exploring Earthquakes materials to polish your own content knowledge, or instead use them directly with your students, the following guide provides ideas for how to get started. Browse to sections that interest you most. For each sub-topic, you'll find sample instructional tasks ready to integrate into your science classroom! Before learning about earthquakes, let’s look at the inside of our planet. What are distinct characteristics of each layer? How is Earth's surface impacted by its interior? Read more about the core, mantle and crust. Movement in narrow zones along plate boundaries causes most earthquakes. Most seismic activity occurs at three types of plate boundaries – convergent, divergent, and transform. 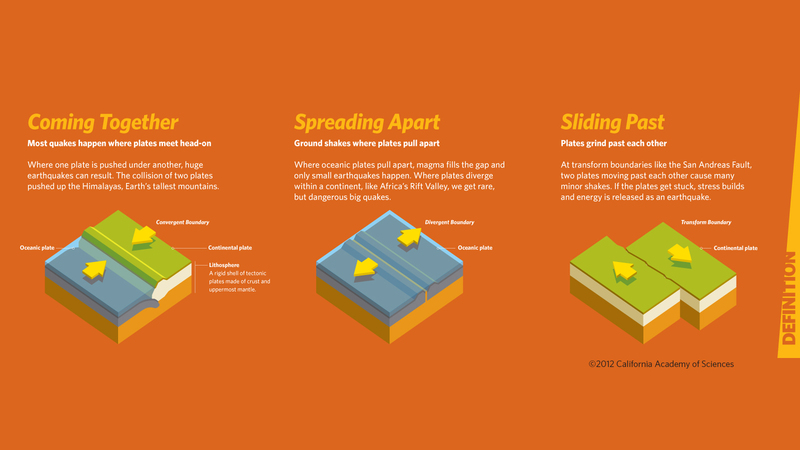 Observe the three types of plate boundaries and note where they occur on Earth. Review the brief description of each boundary type. After watching the Plate Boundaries video, research and find specific examples of convergent, divergent, and transform boundaries. During an earthquake, different types of seismic waves move through the Earth, traveling through solids or liquids differently. This helps scientists understand the properties and composition of the Earth’s layers – the core, mantle, and crust. Look at the Seismic Waves video and discuss with a friend how P and S waves travel differently through the Earth's layers. Today’s configuration of continents is dramatically different than it was in the past. Learn how previous supercontinents formed and then broke up again over hundreds of millions of years due to plate tectonics. Watch the Plate Tectonics: Shaping the Continents video to witness how Earth's forces have shaped the continents from present day to millions of years ago. Choose a location to follow back in time and describe its path. Watch the Back in Time: 200 Million Years Ago to Present Day video on the Earthquake YouTube playlist. Pause the video two to three times while you are watching and reflect on how the land masses have changed over time. The breakup of Pangaea was fueled by the formation of the Atlantic Ocean as new crust was formed along the underwater ridge. By speeding up geologic time through computer simulations, we can witness the movement of the plates and the beginning of this great ocean. You are about to witness the formation of the Atlantic Ocean. Before watching, predict when the Atlantic began to form. After viewing this timelapse video from 200 Million Years to Present Day, describe what the Atlantic might look like in millions of years. Some Evidence of Plate Tectonics comes from what we know about previous life on Earth. Scientists have found fossils of the same land-dwelling animal in Africa and South America. How did similar fossils come to be so far apart? Evidence of plate tectonics has also been gathered from clues left by glaciers and the shapes of coastlines. This has helped scientists to piece together the previous configuration of the continents. How is this possible? After viewing the Records in Rock graphic of fossil evidence, make a list of questions that you have about fossil records and the connection to plate tectonics. Similar fossils from South America and Africa are now separated by an ocean. What connections can you make between this video and the previous graphic? What new questions do you have? View this Remnants in Rock graphic of glacier evidence and discuss how it supports the idea of a past supercontinent. This Complementary Coasts graphic provides evidence of complementary coastlines along Africa and South America. Look at a world map and determine other coastlines that could fit together based on their shapes. Plate tectonics played an important role in the history of ancient civilizations both by causing destructive events and opportunities for life to flourish. Why would early civilizations spring up in tectonically active areas? Although the Earth’s surface is moving and changing through geologic time, we usually do not see it happening before our eyes, but we can experience it through earthquakes. As the plates move past each other, along fault zones, they sometimes get caught and pressure builds up. When the plates finally give and slip due to the increased pressure, energy is released as seismic waves, causing the ground to shake. This is an earthquake. Using the Anatomy of an Earthquake diagram, describe the relationship between the faults and the plates. How are the focus and the epicenter different? Design a demonstration or model using everyday materials showing how earthquakes occur (built-up strain and sudden energy release). Basic fault types found around the world are normal, reverse, and strike-slip. How do fault types relate to plate boundaries? View these animations (*coming in May 2016!) to learn about the basic fault types. Use your own words and hand movements to describe the different fault types to a friend. Read Faults: Where Earthquakes Occur to learn more about the different types of faults. How is the location of the earthquake slip determined? The process is called triangulation. Watch the Epicenter video to learn how to determine the epicenter of an earthquake. 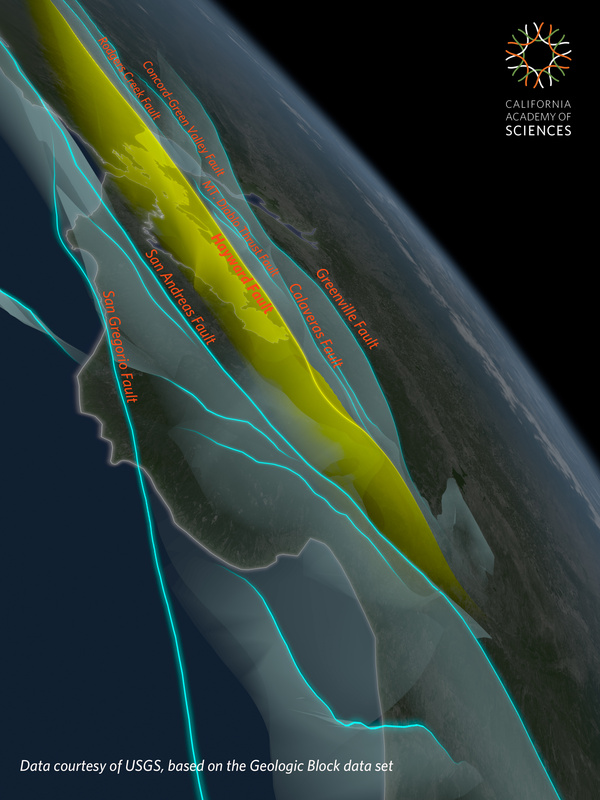 Use the online activity Virtual Earthquake by Geology Labs On-Line to practice finding the epicenter of an earthquake. Alternatively, do this activity to learn how to triangulate. Why is it necessary to have information from three seismograph stations for triangulation? Why is it not possible to find the epicenter using information from just two stations? Why is it important to know where the epicenter of an earthquake is located? What can scientists learn about faults from mapping earthquake epicenters? Earthquakes are generally described by their magnitude (the energy released) and intensity (the damage that is done). Learn how these are measured. Read more about measuring earthquakes. Watch the Magnitude video from a scientist at the Pacific Tsunami Warning Center about earthquake energy release. Describe the difference between a 6.9 and a 8.5 earthquake. Compare the two earthquakes in the Intensity Comparison of the 1906 and 1989 Earthquakes animation. Make some observations about their intensities. An earthquake generates a series of seismic waves that transmit the energy released by an earthquake. They travel through the interior and near the surface of the Earth. Learn about the different types of seismic waves. Build your own seismograph to experience the phenomenon firsthand. What are the different kinds of waves? Which wave moves the fastest? Which wave causes the most destruction? After watching the animation, review with a friend how the buildings fared on the different substrates. On which type of substrate is it safest to build? California lies within an active seismic zone, straddling the Pacific and North American plates, which are grinding past each other. There are many active faults in California that are capable of creating major earthquakes. The Bay Area sits on a series of active faults that include the San Andreas, Calaveras, and Hayward. Read more about Bay Area Faults. Use the Bay Area Fault Planes image to determine how many fault planes cut through the Bay Area. Why do you think there are so many? Watch the Hayward Fault: Predictable Peril video and discuss: Why are scientists so concerned about earthquakes occurring on the Hayward Fault? The San Andreas Fault, part of the boundary between the Pacific and North American plates, has been the source of damaging earthquakes in the Bay Area. In 1906 a large earthquake occurred on the San Andreas Fault that led to the destruction of many city blocks in San Francisco. Where was the focus of the 1906 Earthquake? What do the red and yellow colors represent on the simulation and how are they related? Below are oral history accounts from the 1906 earthquake. Explore these documents and answer the questions provided. Then, seek out a family member or family friend who experienced the 1989 Loma Prieta earthquake. Compare and contrast events as told from several perspectives. Explore these oral history accounts from the 1906 earthquake. ​Compare and contrast the first-person narratives. Why do personal accounts differ from each other? Use this guide to conduct your own interviews of family or family friends who experienced the 1989 Loma Prieta earthquake. Share your findings of your interviews with your fellow students. Do these personal accounts differ from each other? Why? California has experienced many damaging earthquakes. From the damage caused, scientists and engineers have learned how to design buildings that will better withstand the shaking. Over the past few decades, many structures have undergone earthquake retrofitting in the Bay Area and beyond. Watch The Shaking Table at UC Berkeley video to learn more about how engineers make our built environment better able to withstand earthquakes. View the The New Bay Bridge: Earthquake Makeover video to learn about changes to the new Bay Bridge in the San Francisco Bay Area. Creating an emergency plan, preparing an earthquake kit, and safely storing and securing heavy items are a few ways to prepare for the big one! Read How to Prepare for an Earthquake. Make a list of items for your classroom earthquake kit and create a kit that you store at school. Develop an emergency plan. Think about a few places where you spend the majority of your time. This may be at home, at school, in your car, etc. Earthquakes are unpredictable and can happen at any time. It is important to know what to do when an earthquake occurs whether you are at home, at work or at play. Go to the FEMA Ready website and research what to do during an earthquake. Relate this information to your plans for preparing for an earthquake. If an earthquake occurred at home, at work, or at play, what would you do? Imagine realistic scenarios and consider where you would drop, cover, and hold on. Do these locations have hazards? The more prepared you are after an earthquake, the better. Consider the information you have learned regarding what to do before and after an earthquake. It is not known what the situation will actually be after an earthquake. What are necessary steps that you can take to assess the situation and your safety? If you don't already know, take the time to learn how to turn off water and gas in your home. Set a safe location to meet your family or friends after an earthquake. How will you get there? What would you bring with you? (Grade 4) Local, regional, and global patterns of rock formations reveal changes over time due to earth forces, such as earthquakes. The presence and location of certain fossil types indicate the order in which rock layers were formed. (Grades 6-8) Tectonic processes continually generate new ocean sea floor at ridges and destroy old sea floor at trenches. (Grades 9-12) Continental rocks, which can be older than 4 billion years, are generally much older than the rocks of the ocean floor, which are less than 200 million years old. (Grades 9-12) Evidence from deep probes and seismic waves, reconstructions of historical changes in Earth’s surface and its magnetic field, and an understanding of physical and chemical processes lead to a model of Earth with a hot but solid inner core, a liquid outer core, a solid mantle and crust. Motions of the mantle and crust occur primarily through thermal convection, which involves the cycling of matter due to the outward flow of energy from Earth’s interior and gravitational movement of denser materials toward the interior. (Grade 4) The locations of mountain ranges, deep ocean trenches, ocean floor structures, earthquakes, and volcanoes occur in patterns. Most earthquakes and volcanoes occur in bands that are often along the boundaries between continents and oceans. Major mountain chains form inside continents or near their edges. Maps can help locate the different land and water features areas of Earth. (Grades 6-8) Maps of ancient land and water patterns, based on investigations of rocks and fossils, make clear how Earth’s plates have moved great distances, collided, and spread apart. (Grades 6-8) The planet’s systems interact over scales that range from microscopic to global in size, and they operate over fractions of a second to billions of years. These interactions have shaped Earth’s history and will determine its future. (Grades 9-12) Plate tectonics is the unifying theory that explains the past and current movements of the rocks at Earth’s surface and provides a framework for understanding its geologic history. Plate movements are responsible for most continental and ocean-floor features and for the distribution of most rocks and minerals within Earth’s crust. (Grades 9-12) Plate tectonics can be viewed as the surface expression of mantle convection. (Grade 3) A variety of natural hazards result from natural processes. Humans cannot eliminate natural hazards, but can take steps to reduce their impacts. (Grade 4) A variety of hazards result from natural processes (e.g., earthquakes, tsunamis, volcanic eruptions). Humans cannot eliminate the hazards but can take steps to reduce their impacts. (Grades 6-8) Mapping the history of natural hazards in a region, combined with an understanding of related geologic forces can help forecast the locations and likelihoods of future events. (Grades 9-12) Natural hazards and other geologic events have shaped the course of human history; [they] have significantly altered the sizes of human populations and have driven human migrations. (Grades 9-12) Geologists use seismic waves and their reflection at interfaces between layers to probe structures deep in the planet. Take a virtual expedition with us to investigate the amazing diversity of life on this planet.